VATICAN CITY (CNS) — Priests must identify with people who are excluded and not be blinded by complex theology, an excessively “bubbly” and watered-down spirituality, and worldliness that is more and more accessible in the digital age, Pope Francis said. Priests can also be oppressed by the allure of a “thousand commercial advertisements” that impede them from going forward “along paths that lead us to love of our brothers and sisters, to the Lord’s flock, to the sheep who wait for the voice of their shepherds,” he said March 24 during the chrism Mass in St. Peter’s Basilica. However, Jesus comes to redeem and transform them from being poor and blind to ministers of God’s mercy and consolation. 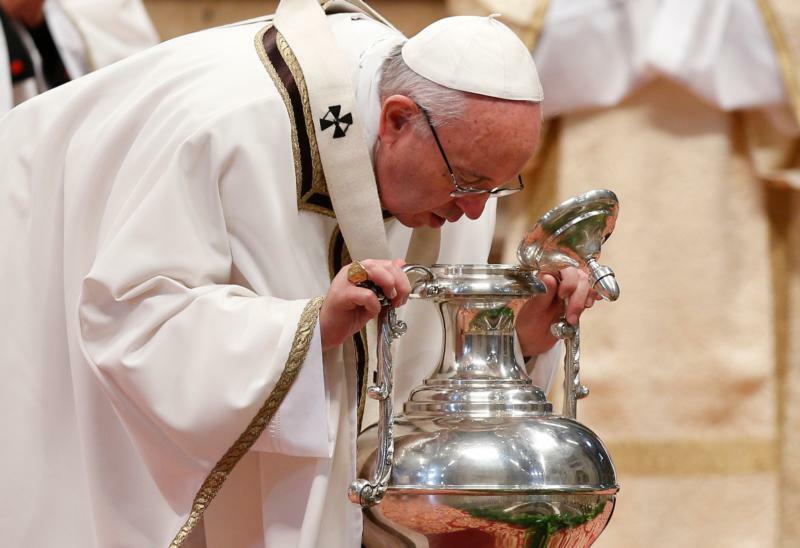 Pope Francis presided over the first of two Holy Thursday liturgies, in which he blessed the oils that will be used in the sacraments of baptism, confirmation, ordination and the anointing of the sick. Later in the day, he celebrated the Holy Thursday Mass of the Lord’s Supper at a refugee center in Castelnuovo di Porto, about 15 miles north of Rome. Commemorating Jesus’ institution of the priesthood, Pope Francis led thousands of priests, bishops and cardinals surrounding the basilica’s main altar in renewing their priestly vows. The pope reflected on the day’s Gospel reading from St. Luke, in which Jesus proclaims the fulfillment of Isaiah’s prophecy of the Lord’s anointed one, who brings glad tidings to the lowly, healing to the brokenhearted and liberty to those held captive, releasing the imprisoned and comforting those who mourn. Despite encountering opposition to his words, Jesus “‘passes through the midst’ of all those who would stop him and ‘continues on his way,'” the pope said. “Jesus does not fight to build power. If he breaks down walls and challenges our sense of security, he does this to open the floodgates of that mercy which, with the Father and the Holy Spirit, he wants to pour out upon our world,” he said. Recalling Jesus’ parable, the pope said the first area is the joyful encounter between the merciful father and the prodigal son, an encounter that serves as a reminder to “not be fearful of exaggerating our gratitude” to God. “Mercy restores everything; it restores dignity to each person. This is why effusive gratitude is the proper response: We have to go to the party, to put on our best clothes, to cast off the rancor of the elder brother, to rejoice and give thanks,” he said. The pope added that the proper response to the father’s forgiveness is “a healthy tension between a dignified shame and a shamed dignity” that allows one to seek “a humble place” while allowing “the Lord to raise him up for the good of the mission, without complacency. As ministers of God’s overabundant mercy, Pope Francis reminded the priests, bishops and cardinals present that growing in this humbling dignity can help them understand their true calling. “It is people who are poor, hungry, prisoners of war, without a future, cast to one side and rejected, that the Lord transforms into a priestly people,” the pope said.